Forty one people attended as well as Garda Alex McDermott Roe and Garda Karen Baxter. Apologies were received from 10 neighbours. The main purpose of Neighbourhood Watch is to reduce opportunities for Crime in our area (Pines, Hadleigh Court, Park and Green) by improving personal and home security, maintaining a security awareness and fostering a community spirit where we as neighbours look out for one another. We will maintain a positive and active relationship with our local Gardai and support them in their efforts in crime prevention and detection. They remain the first port of call. 2. Minutes of 2017 AGM had been circulated and were taken as read. Progress on 2017 actions is contained in the Area Coordinators Report. 3. Review of the Neighbourhood Watch activity for the past year. Christmas trees Lots Later but still lots Much improved – Only a trickle. 95% of households are signed up to the Text Alert system and 87% receive communication from our Neighbourhood Watch by email. Much improvement this year with only a couple of trees left on the green. Much thanks to the operations team from Fingal, the Gardaí and all our neighbours for their support. We raised this issue with Fingal and with a number of our local representatives, who have in turn raised at a council level. We have received a response that Fingal will have an engineer review the junction and that they expect to restore the solid white line on Auburn Avenue during the Summer. Question was raised about people living in the Pines East and Phoenix being able to turn right. Garda McDermott confirmed that where there was enforcement, it would be the same rule for all. We appreciate the sponsors that supported our golf and neighbours’ night during the year. We have listed them on the website and encourage our members to support them during the year. One of the most common issues that we face are bogus traders calling door to door, either using the cover to gain access to houses or to scam householders into paying for work not done. Engaging with these traders not only puts you at risk but it also puts your neighbours at risk. On www.pineshadleigh.com/trades we now have a list of electricians, plumbers, painters, builders, carpenters, locksmiths, alarms and maintenance trades that have been recommended by neighbours. There is always room for more if you have someone that you could recommend. Household contributions received to date are €1,280 representing €10 for 2018 and 2019 from 90% of households. No grant was received from Muintir Na Tire in 2017/18. Expenditure of €639 was slightly higher than budget. We had an extra meeting in the Parish centre for the Crime Prevention talk €75 and we incurred €43 with Hosting Ireland for the domain renewal www.pineshadleigh.com which covers us for the next 2 years. 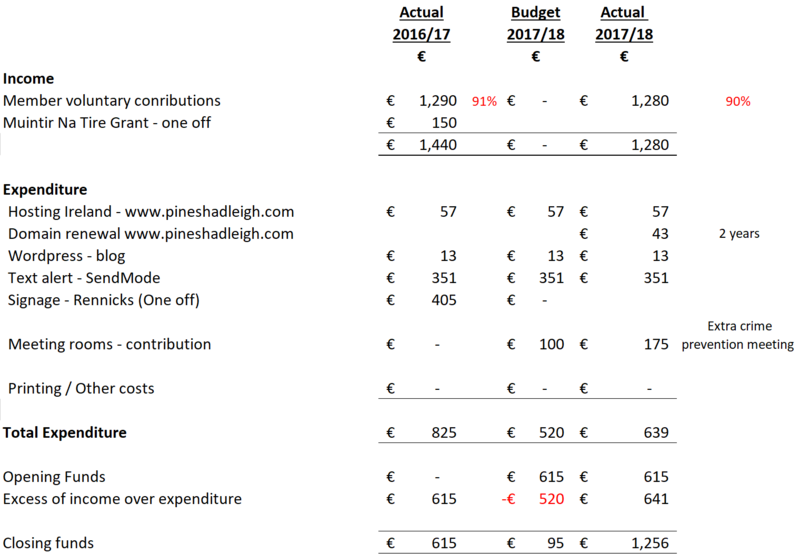 Text alerts sent by Sendmode cost €351 which was in line with previous years. The neighbours’ night was funded by direct contributions to the restaurant and golf club with sponsors providing prizes, achieving the aim to run at breakeven. At the current rate of expenditure, we should be fine for the next 2 years, thanks to the contributions received from all. We can organise locksmiths again if this is something that people would like. In terms of CCTV and alarms, we may look at an event during the year to provide advice and options to those that are interested. Golf and social – neighbours night. We have been delighted with the support for these events over the last 2 years. We will do something again this year but would love to get input from people on what they would like to see. The social committee will advise in the coming months. 5. Confirmation of Area coordinator, street coordinators, secretary and treasurer roles. The current team have made themselves available to support the scheme again in the current year. We are always keen to hear from more people that are willing to get involved. Street Coordinator: Liam Delaney, John Murphy, Charlie O’Connor, John Nolan, Peter Blessing, Tom Kennington, Freda Gallagher, Dan O’Shea, Carmel Grogan and Ruth Hogan. Secretary: Freda Gallagher will take over from Ruth Hogan for the coming year. Many thanks to Ruth for her work through the year. Freda Gallagher will be added as an extra signatory on the Post Office account. 6 .Q&A with local Community Policing team. Garda Alex Mc Dermot Roe informed the meeting that 3 concerts are planned to take place in the Phoenix Pk this summer and extra police patrolling can be arranged for our area if requested. An armed response unit is now being utilised. Gardai are willing to follow up on persistent offenders of R hand turn into the Pines. He advised to be aware of vans in the area and report anything suspicious to the Blanchardstown Garda Station or 999 which is the first port of call in an emergency. Park villas have recently set up a Neighbourhood Watch. People should ensure that their cars are locked in car parks as the press button key locking mechanism can be intercepted. People who are withdrawing large sums of cash from the bank need to be vigilant.